He started off by wanting a flourless chocolate cake to bring to his cosmic bowling party, but then after poring through many cookbooks he decided on a Denver Chocolate Pudding Cake. The inspiration for this cake came from a Williams Sonoma “Chocolate” cookbook, believe it or not. I like a lot of William Sonoma’s recipes for truffles in addition to their cake recipes, because they help you get started before you are overwhelmed with fancy techniques from other cookbooks. 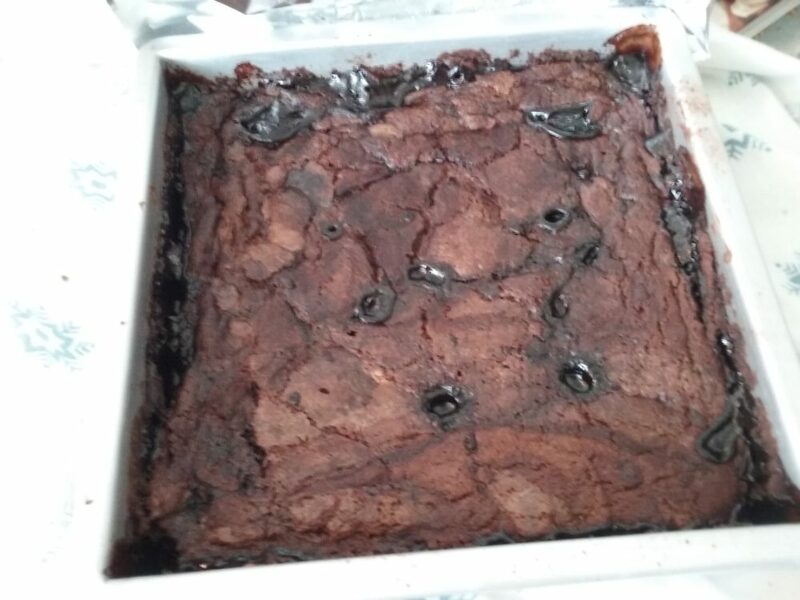 The Denver Chocolate Pudding cake was fun and easy to make. It doesn’t even contain eggs. In a pan, you build a layer of batter, sprinkle the pudding filling and then pour some boiling water on top. The cake just cooks in the oven for an hour which was perfect while I was getting other things done for the party the next day. The cake was very tasty. I took some fresh whipped cream to the bowling alley with me and it was still gooey and delicious. My friend mentioned later that the pudding cake can be served neatly with a spatula, but our friends had no trouble being flexible at a bowling break.